ICF Homes: Learn the advantages and disadvantages of ICF homes. What are the advantages and disadvantages of ICF homes? ICF homes provide a solid solution to high energy costs and extreme weather. There are advantages and disadvantages of ICF homes, so educate yourself before making a final decision. ICF stands for insulating concrete forms. Although there are many manufacturers of ICF forms (or "blocks"), the premise is the same with each of them. 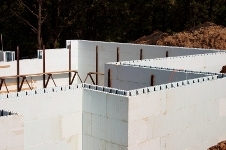 ICFs are forms for poured concrete walls. With a sturdy foam on both sides, these forms stack like LEGO® blocks. Strong steel reinforcement is added within the forms, then concrete is poured inside the forms. 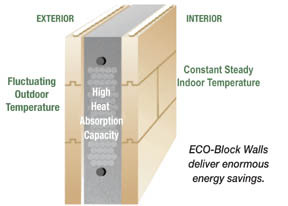 The forms are then left in place, which provides an added layer of insulation on both the exterior and interior of the home (see illustration below). ICF construction became popular in Europe roughly 30 years ago, and caught on in the U.S. in the 1990s. ICF is approved by every major code agency in the U.S. and Canada. In addition, ICF has been proven successful in every climate and region. According to the Insulating Concrete Form Association, the use of ICFs has risen 73% over the past 5 years. Although the ICF blocks may sound strange, ICF houses can be finished to look like any other house. You can use the same exterior and interior finishing materials as you would in a wood-framed house. And ICF houses actually have more design flexibility: your designer can easily form curves, contours, and arches. Click here to learn more about designing ICF house plans. Plumbing and electrical components are easily cut into the interior foam face once the concrete has been poured. Large pipes can be fit into the ICF forms prior to pouring the concrete. Click here to view an ICF home under construction. Significant energy savings: In a study by the Portland Cement Association, ICF homes saved up to 50% on heating and cooling costs over wood-framed homes. The poured concrete walls provide an excellent thermal mass, which helps maintain an even indoor air temperature. This also allows you to spend less on a smaller HVAC system. Severe weather resistance: Concrete houses have survived tornadoes and hurricanes in areas where wood houses were flattened. When they are properly engineered, they should also withstand earthquakes. Texas Tech University conducted a study to determine the suitability of ICFs for above-ground storm shelters, wood stud “missiles” fired under tornado conditions were unable to penetrate ICFs. Click here to learn more about how ICF makes a house hurricane resistant. Significantly lower insurance premiums: Insurance premiums can be up to 50% less with ICF homes, especially in areas where severe weather (hurricanes, tornadoes, etc.) is common. Insect resistant: In many areas of the country, termites are a major problem. There is nothing for termites to eat in an ICF house. Significant exterior noise reduction: Studies have shown that about only one-third of exterior noise penetrates an ICF wall as compared to a wood-framed house. Super-high R-values: The ICF walls themselves perform similar to a wood-framed wall with R-30 insulation. However, the actual R-value is actually R-40 or higher when air infiltration (leakage). ICF walls eliminate air leakage, which can represent 20 to 40% of the heat load requirements of a typical wood frame building. Four times the fire resistance of wood-framed homes: Traditional wood framed walls can withstand only 15 minutes to 1 hour of fire; whereas concrete walls can withstand up to 4 hours. Environmentally friendly: Using ICF blocks to construct a 2,000 square foot home will also save almost 50 trees. And they're health-friendly, too: ICF blocks contain no formaldehyde or other toxic gases that could affect indoor air quality. The one potential downside with an ICF house is its cost. Like lumber, the cost of concrete does vary, and can sometimes cost more than lumber. Depending on the current cost of concrete, ICF building can run from 1% to 8% more than wood framing. Considering that a framing package for a wood-frame house is about $15,000 for a 2,000 square foot house, that amounts to $150 to $1,200 more. That additional cost can easily be recovered through lower insurance premiums and energy costs. However, some ICF houses may actually be much CHEAPER than wood-framed homes. The design of the house does play a role in building expense, and the more simple the shape of the house, the lower the ICF building costs. Here at Wise Home Design, we firmly believe that the advantages of ICF homes more than outweigh any cost disadvantage. We highly recommend considering ICF construction. Return from ICF Homes to Concrete House Plans. Return from ICF Homes to the Home Page.